Flying a powered hang glider over the Cyprus coast. A foot-launched powered hang glider (FLPHG), also called powered harness, nanolight or hangmotor, is a powered hang glider harness with a motor and propeller in pusher configuration. An ordinary hang glider is used for its wing and control frame, and the pilot can foot-launch from a hill or from flat ground, needing a length of about a football field to get airborne, or much less if there is an oncoming breeze and no obstacles. 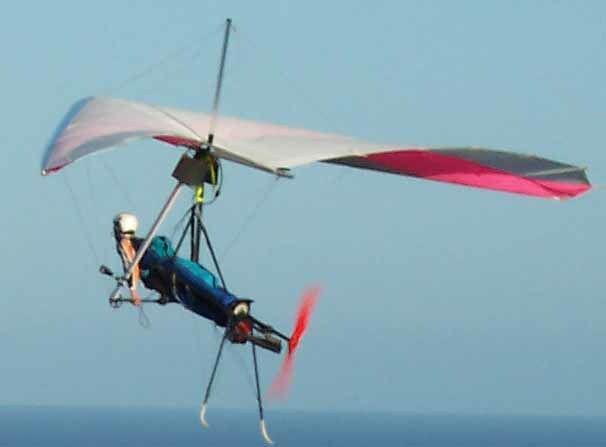 Although the main appeal of FLPHGs is to the already experienced hang glider pilot, interest in these machines is growing rapidly, particularly in areas where there are no hills for foot-launching. 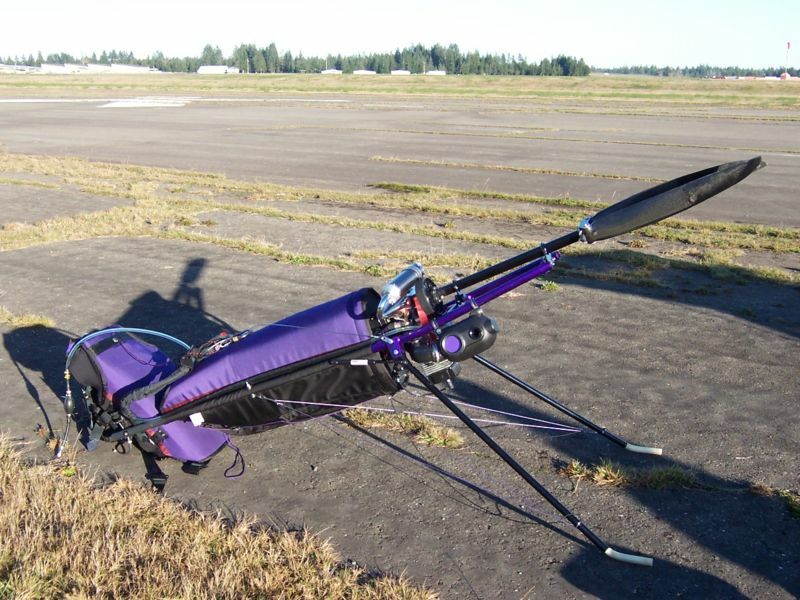 The pilot can cruise in good weather at speeds of 40 to 72 km/h (25 to 45 mi/h), but powered harnesses have limited power, range and thrust, so are best used as self-launch devices to achieve enough altitude to find a warm-rising air thermal for soaring. Summary: Some glider flights have been recorded as early as 875 AD. Most early glider designs did not fulfill safe flight; the problem was that early flight pioneers did not understand the underlying principles that made a bird's wing work. Starting in the 1880s technical and scientific advancements were made that led to the first truly practical gliders. Otto Lilienthal, a German engineer, duplicated some of his contemporaries' work and greatly expanded on it from 1874. He rigorously documented his work, strongly influencing later designers; for this reason, Lilienthal is one of the best known and most influential early aviation pioneer. His type of aircraft is now known as a hang glider. In 1951 Francis Rogallo and Gertrude Rogallo together applied for a patent for a fully flexible wing, the flexible wing or Rogallo wing, which in 1957 the American space agency NASA began testing in various flexible and semi-rigid configurations in order to use it as a recovery system for the Gemini space capsules. The various stiffening formats and the wing's simplicity of design and ease of construction, capability of slow flight and gentle landing characteristics, did not go unnoticed by hang glider enthusiasts. 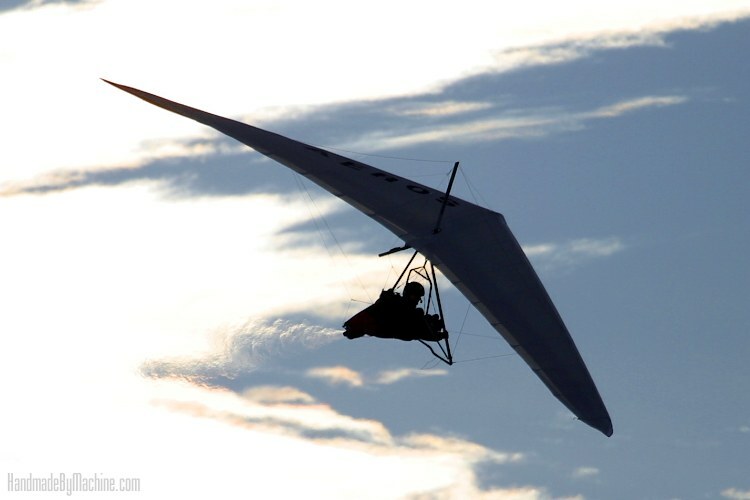 Some designers soon adapted Rogallo's flexible wing airfoil onto elementary hang gliders, producing the most successful hang glider configuration in history. The Ente was the first rocket-powered aircraft. Germany, 1928. Powered 'Standard Rogallo' hang glider. Argentina, 1975. Icarus V hang glider powered with a G8-2 rocket engine, 1979. John Moody's powered Icarus II. Southeastern Wisconsin Aviation Museum. Motolotnia - White Eagle backpack flown by Tony Prentice on a Wasp Falcon IV glider. UK, 1985. The reaction of most pilots would be to say that powered microlights (ultralights) developed from hang gliding in the late 1970s, but it was not that simple. In fact, microlights are a rebirth, a return to the love of low-speed flight which the earliest aviators felt so keenly, but which was subsequently lost in the quest for military superiority. For a second time in aviation history, during the 1970s, motorization of simple gliders, especially those portable and foot-launched, became the goal of many inventors and gradually, small wing-mounted power packs were adapted. These early experiments went largely unrecorded, even in log books, let alone the press, because the pioneers were uncomfortably aware that the addition of an engine made the craft liable to registration, airworthiness legislation, and the pilot liable to expensive licensing and probably, insurance. 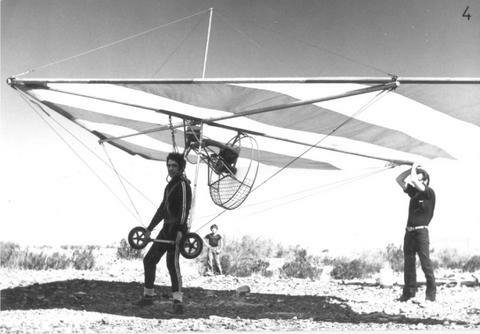 Inventors from Australia, France and England produced several successful microlight motor gliders in the early 1970sand very few were portable wings. Most hang gliders had poor performance. Small engine technology was underpowered and unreliable. Piloting skills and experience were limited. In 1963 and during his free time, aeronautical engineer Barry Palmer built and experimented with a foot-launched powered hang glider at Bloomfield, Connecticut. 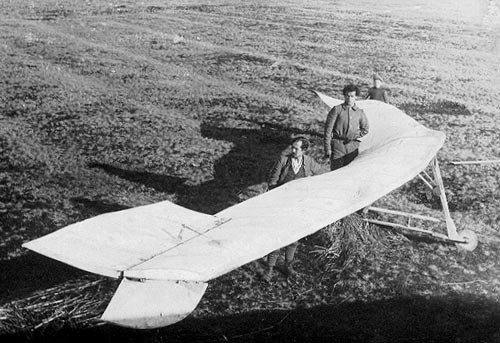 It was powered by a 7 hp (5 kW) West Bend engine and mounted on top of a Rogallo-type flexible wing hang glider; the propeller was 3 feet (1 m) in diameter and was made of balsa wood, covered with fiberglass and mounted in pusher configuration. But the engine was quite underpowered and the craft could not achieve flight. It is now estimated that a modern flexible Rogallo wing hang glider requires at least 6 hp (4 kW) at the prop shaft and about 45 lbf (200 N) of thrust just to maintain level flight. Barry Palmer build during 1967 what is likely the first weight-shift powered trike aircraft. In 1973, Australian Bill Bennett, who was one of the most skilled pilots of the time and the largest U.S. hang glider manufacturer, was following in Barry Palmer's footsteps and attempting to motorize a flexible hang glider. Bennett built a McCulloch engine backpack that drove a small caged propeller. It did not, however, work particularly well, as the prop was almost completely masked by his back, and what little efficiency remained was further reduced by the thick wire guard with which Bennett was prudent enough to surround the propeller. In practice, when used with the best hang glider of the day, it was nothing more than a glide extender. In the late 1970s, light two-stroke engines started to become more powerful and reliable and hang glider pilots were developing their skills to such an extent that they no longer considered it normal to crash each time they flew. The only unanswered questions were where to fit the engine, the size and pitch of the propeller and how it was driven. On March 15, 1975 John Moody successfully added a 12.5 hp (9 kW) West Bend engine with a 71 cm (28") propeller to an Easy Riser biplane hang glider designed by Larry Mauro. Moody opened the throttle and ran until he lifted from the frozen surface of a lake west of Racine, Wisconsin and he flew for 30 minutes. Then on July 27, 1976 John Moody demonstrated ultralight aviation at the annual EAA fly-in convention in Oshkosh, Wisconsin with a foot launched McCulloch 101 powered Icarus IIin front of thousands of aviation-loving spectators, starting the modern ultralight aviation revolution in the USA. Later he added wheels to the aircraft and by the end of 1979, there were almost 100 competing companies selling powered ultralights (microlights) but very few were foot-launchable. During the mid-1970s in England, Steve Hunt experimented by fitting a Scorpion glider with a McCulloch chainsaw engine driving a keel-mounted ducted fan via a reduction gear unit, but he stopped development "because it was too heavy". However, he visualized the need for a clutch unit to facilitate starting and to reduce shock loading on the drive system. Meanwhile, powered hang glider flight was progressing in the United States and in 1977 the Soarmaster company located in Scottsdale, Arizona, produced the first commercial foot-launched powered hang glider, the Soarmaster. The unit was recommended for fitting on an Electra Flyer Cirrus or Olympus hang glider, as the mounting brackets and thrust line calculations had been done for these two gliders only. The Soarmaster company had developed a two-stroke engine unit with splash box-lubricated chain reduction system, clutch and long drive-shaft that bolted just below the hang glider keel. It produced about 10 hp (7 kW) for about of 80 lbf (360 N) of static thrust and sustained climb rate as high as 150 ft/min (0.762 m/s). The keel-mounted transmission rendered the aircraft pitch unstable under power so a fine balance existed between applying too much power, causing the aircraft to overtake the pilot or not enough power for flight. Though marginal and difficult to fly, the Soarmaster was an encouraging development, until strange accidents began to happen; when the pilot pushed out or stalled the wing, propeller-related injuries to their feet ensued, earning it nicknames such as ToeMaster and SawMaster. It turned out that when the pilot went weightless or stalled under power, the glider would tuck forward violently because the line of thrust was well above the centre of gravity. In 1979, a powered backpack called Motolotnia - White Eagle, designed by Jerzy Kolecki, became available for sale. It consisted of a 90 cc McCulloch chainsaw engine with a direct drive 61 cm (24") wooden prop, producing a quoted 77 lbf (340 N) of thrust; the rate of climb was about 150 ft/min (0.76 m/s) and flight duration was limited by the small fuel tank and engine overheating after several minutes. Other powered harnesses to reach the market in the 1980s were The Ranger and the Relax 220. The first truly successful foot-launched powered harness was the Mosquito. It did not have a keel-mounted motor, but the complete power unit was incorporated in the harness' frame. The harness was hooked on to the glider by a regular hang strap, placing the center of mass well below the keel, the ideal position for effective weight-shift control and thrust transmission. The Mosquito was designed and produced by Swedish inventor Johan Åhling (Swedish AeroSport). Åhling's Mosquito flew first in 1987, but it had only 10 horsepower and a few problems had to be worked out. When the Mosquito was released again in 1990 with a reliable 15 hp (10.2 kg, 118 cc) go-kart engineits appeal grew first amongst European and Australian hang glider pilots, and it was not until the late 1990s that the Mosquito started to become somewhat popular in North America, that by then, was obsessed with larger and heavier ultralights and undergoing a decreasing hang glider pilot population. Åhling's Mosquito was later redesigned and released in 2000 as the NRG. As of 2008, there are a few harness designs similar to the Mosquito/NRG, each sporting unique strengths, and produced by other FLPHG manufacturers. The latest generation of powered harnesses bear names such as Wasp , DoodleBug, Raven, X1, Zenon, Explorer LD, and Fillo. On April 30, 2003 a modified DoodleBug named 'JetBug' took to the skies over England while powered by a 95 pounds force (420 N) thrust gasoline turbine engine. The JetBug was produced in collaboration between Flylight Airsports Ltd. and MicroJet Engineering; it was piloted first by Ben Ashman and then by Stewart Bond. Its flight autonomy was only of ten minutes at 1 Liter/min. The JetBug is an occasional guest at air shows across England. Unofficial FLPHG World Records - Confirmed but not validated by the FAI. In October 1977, Trip Mellinger successfully flew his Easy Riser from mainland California to Catalina Island some 42 kilometres (26 mi) offshore. On 5 August, 1978 French pioneer Bernard Danis mated a Soarmaster unit to this 168 square feet (15.6 m) SK 2SS wing and climbed to 1,825 metres (5,990 ft) above sea level at the Southern Alps. May 9th. 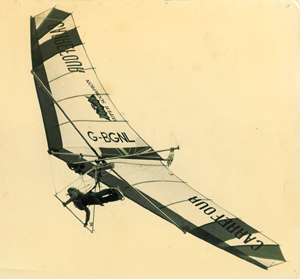 1978, David Cook becomes the first pilot to cross the English Channel while flying on a foot-launched powered hang glider; he used a VJ 23F glider. In 1979, American pilot Larry Mauro flew 162 kilometres (101 mi) on a foot-launched Easy Riser powered hang glider. Gerry Breen - London to Paris in FLPHG. August 25, 1979. On 7 May, 1979 British pilot Gerry Breen set a new distance record for FLPHG of 325 kilometres (202 mi) from Wales to Norwich, a non-stop world distance record that still stands today; using a Soarmaster, the flight took about 4 hours with a tailwind of about 25 knots (29 mph) and reportedly consumed 25 litres (5.5 imp gal) of fuel. Three months later, on August 25 through 28, inspired by the film "Those Magnificent Men in their Flying Machines" and sponsored by British Airways, Breen flew his powered hang glider from London to Paris: Wishing to use a British made aircraft, Gerry Breen and Steve Hunt set about building with their version of the powered Soarmaster, but had no clutch. The unit, including glider, was considerably heavier than the Soarmaster and Olympus glider combination but the wing was much more robust. The hang glider was a Hiway Super Scorpion with a 10 hp (7 kW) McCulloch 125 cc engine mounted on the keel just forward of the hang strap. The journey was plagued with mechanical failures but Breen overcame them and completed the trip. In July 2002, Italian hang gliding champion and conservationist, Angelo d'Arrigo, guided a flock of 10 endangered Western Siberian Cranes, bred in captivity, with an Icaro hang glider equipped with an NRG powered harness 5,300 kilometres (3,300 mi) from the Arctic circle in Siberia, across Kazakhstan to the shores of the Caspian Sea in Iran, avoiding Afghanistan and Pakistan where they fall victim to the abundant guns. For the most part, he relied on the sun and wind for propulsion in order to teach the young cranes to soar long distances. This exhausting $250,000 USD experiment lasted for six months and finished in winter 2002. If repeated a few times, scientists hope the new migratory route will be passed on from parent to fledgling for generations of cranes to come. In 2005, Chris Street soared his Explorer harness and Litesport hang glider over Mt. Cook, in the Southern Alps, New Zealand, at an altitude of 4,114 metres (13,500 ft) above sea level (ASL) while aided by mountain wave lift. On April 24 2005, English pilot Stewart Bond flew his DoodleBug and Aeros Discus-14 glider in still air at an altitude of 3,706 metres (12,160 ft) ASL. On July 16 2005, American pilot Bruce Decker performed a 3,048 metres (10,000 ft) high density altitude takeoff in Colorado, USA using an X1 harness on an ATOS 146 rigid wing hang glider; the wind was only 4.8 kilometres per hour (3.0 mph). On September 13, 2008, Irish pilot Patrick Laverty approximated the powered harness altitude world record when he flew his home-made supine custom-made harness equipped with a 29hp ROS 125 engine and the Tuna carburation system, coupled to an Aeros Discus 14 hang glider. Takeoff was at 600ft ASL and he flew to an altitude of 4,668 metres (15,310 ft) ASL over Talybont, Ceredigion, Wales, UK. FLPHG with a folding propeller. Currently, there are two harness configurations: prone (face down) and supine (sitting). Both configurations allow the pilot to takeoff and land on his/her feet. 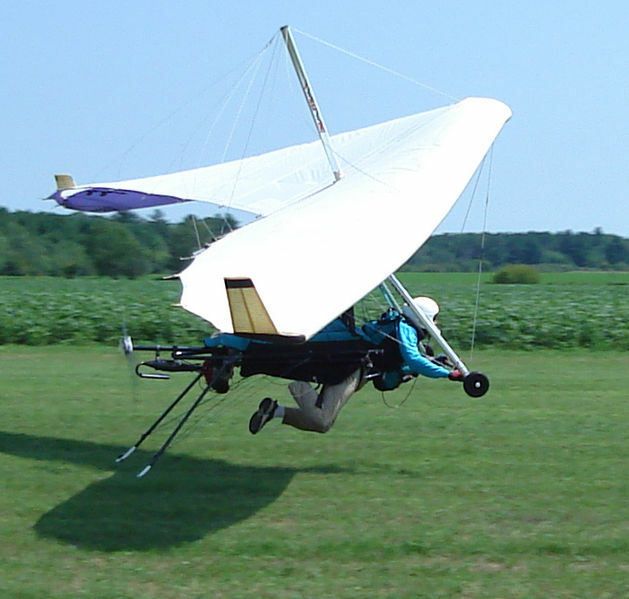 Foot-launched powered hang glider (FLPHG) harnesses are built around a light metal frame with the engine and propeller mounted on the rear in a pusher configuration. Current powered harnesses weigh 22-32 kg (50-70 lb) not including the safety parachute and fuel, and fold neatly into a 1.5 metres (4.9 ft) long harness bag with a handle. Most powered harnesses in production are equipped with the 'Radne Raket 120' two stroke engine which is based on Husqvarna XP3120 chainsaw parts. It has a displacement of 118 cubic centimetres (7.2 cu in) and produces about 15 hp (11 kW) at 8900 RPM if equipped with a tuned exhaust; when coupled to a 1:3.5 belt-driven reduction drive and a 52" x 22" propeller, it produces about 100 lbf (440 N) of static thrust. For heavy pilots or pilots operating from higher than 1,500 metres (4,900 ft) MSL fields, a powered harness equipped with an 18 hp (13 kW) engine is recommended. It is now estimated that a modern flex wing hang glider requires at least 6 hp (4 kW) at the propeller and about 30 or 40 lb of thrust to maintain level flight at 'best glide' speed. The motor is supported on the ground by two retractable skids, holding the propeller just off the ground. The 4 Liter aerodynamic fuel tank is attached to the top of the control frame or is enclosed in the harness. Getting into the harness requires passing both legs through padded straps and wearing the harness like a vest, with a zipper and/or buckles at the front. The powered harness is hooked to the glider via a regular hang strap. The whole aircraft is easily maneuvered on the ground into takeoff position with the pilot buckled into the harness and ready to start the unit by themselves either with a manual or with an electric starter. The throttle is activated during takeoff by means of a mouth-throttle in order to have both hands free for proper weight-shift control. Once airborne, a foot throttle, thumb throttle or cruise control can be used. Zipping up the harness also retracts the rear skids, which are then clipped into clamps on the side of the harness. The propeller is locked in place while soaring power-off, as a windmilling propeller has more drag than a stationary one: Expect a 10 to 20% decrease in glide performance with a windmilling propeller (clutched units) and 2 to 4% decrease with a locked propeller. A folding propeller is often preferred by pilots who want optimum soaring and cross country performance with the engine turned off. Engine controls - Hang gliders are controlled by simply shifting the pilot's weight, but a powered harness must have engine controls and the pilot must know exactly where they are, without having to look and find them. Engine controls are ergonomically positioned at the sides of the harness, chest or shoulder straps and generally consist of throttle, choke, propeller lock, recoil starter handle or electric starter button and decompression valve. During training, it is very important to hang the harness from a solid location, climb in and practice often so that the pilot can automatically reach and activate any engine control without first looking to find it. Good gliding weather: Light wind and cumulus clouds with dark flat base. Hang gliding is an extreme sport but perhaps often viewed as a higher-risk sport than it actually is. Nonetheless, there is great potential for injury for the reckless or ill-prepared. Unlike powered paragliding, it is absolutely essential that the aspiring pilot first take lessons in an unpowered hang glider at a certified school and achieve some solo experience in order to develop all needed skills to perform automatic control inputs and consistently safe landings. Tow is the best launch method for progression to FLPHG. Basic aerodynamics, flight concepts, some meteorology, local regulations, field choice, safety and emergency procedures must also be learned during training. It is sometimes said that the factor which most affects safety is pilot attitude. A large proportion of accidents involve over-confident novices failing to heed advice, or pilots flying beyond their limits. Flying often can keep the pilots' skills current. A major safety consideration is simply having a large enough field that is free of obstructions. The pilot must not assume how fast he will climb or that the engine will not quit. The pilot needs to have a way to safely turn back or land at all times during every flight. Safety precautions include: Certified training, equipment maintenance, pre-flight checks of glider and harness systems, helmet, safety wheels at the lower end of the control frame, helmet, a hook-knife (for cutting the parachute bridle after impact or cutting the harness lines and straps in case of a tree or water landing), and a special emergency parachute (Note that unlike skydiving reserve parachutes in which the main canopy is cut away before deployment, hang gliding & paragliding reserves are designed to open at low speeds and deploy with the glider still attached to the pilot.) Water, knee pads, gloves a mobile phone and/or a transceiver radio are also desirable. Common takeoff mistakes: 1) The pilot quit running before establishing climb and, 2) He is pushing on the control bar while still at low speed, generating too much drag to accelerate and climb. Takeoff run: the pilot must lean forward and avoid pushing the control frame. Launching and landing are done into wind. Though it is possible to launch and land in no wind, a steady 8 km/h (5 mi/h) breeze is ideal. A successful takeoff depends mostly on level wings, speed and precise control of the angle of attack: If the angle of attack is too low then the powered glider will simply not fly. If the angle of attack is too high, then excessive drag results in not getting the speed needed to fly and climb. A committed and fast run is required with a smooth control of pitch angle throughout the run, similar to a shallow slope launch (see: aborting a takeoff). The pilot remains upright throughout the run--allowing forward acceleration to be gradually provided by the thrust, so the pilot does not use his legs to accelerate but only to carry the weight of him and the glider. By gradually increasing thrust, the pilot has time to counter the pitch-up moment introduced by the thrust with an appropriate counter pitch-down control movement. The pilot runs as long as necessary, taking strides of ever-increasing length ('moon walking') and during the last steps most of the pilot’s weight will be carried by the glider. There must be no noticeable change in pitch angle, and the pilot will have stopped running only after the last steps no longer touch the ground. Failure to remain upright throughout the takeoff run is one of the main problems that experienced mountain-glider pilots suffer, as their normal tendency is to move towards prone position as soon as they feel the glider lifting. But on a flat-ground powered takeoff, one does not have the hill dropping away to help achieve flying speed - the pilot must keep running up until he is firmly established in a climb. What can often make the difference between a successful takeoff and settling back to earth are those last long 'moon walking' steps. During the takeoff run, the thrust must be transmitted to the glider through the hang strap and not through the pilot's hands to the control frame. 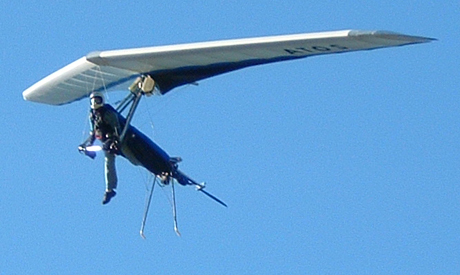 By the time the glider comes off the pilot's shoulders, he must pull in and move his upper body forward through the control frame so that the hang strap becomes tight and is angled slightly forward, all while he is still upright and running. Because the thrust force enters the glider right at the hang point, it only requires a light touch to control the pitch. During takeoff, particularly if something has started to go wrong, a too-strong grip on the down tubes may cause the engine torque to be transmitted through the pilot to the glider. A tight grip can induce a roll which may require a rapid decision to abort the takeoff. A light touch on the control bar at all times can help to avoid this. Pull in and allow the glider to fly on ground effect for as long as possible in order to accelerate - the glider will climb on its own once it has the speed to do so; use of a speed bar helps to pull in more effectively at this stage. Resist the temptation to push out. Shortly after lift-off, many gliders will suddenly climb too fast - be prepared for this, pull in, and you will avoid a stall. The overall sensation and glider behavior is similar to that of being aero towed or winch towed. A powered launch is easier to do well if you allow the glider to achieve flight from the trim position - so you want to make sure this glider trim speed is fast enough for safety. If you are trimmed exactly at minimum sink (very close to mush/stall) then it would be advisable to move the hang point forward to where you have good roll response and control authority without pulling in (when gliding power-off). Setting the trim speed higher will mean you have to run a bit faster, but when you do get airborne it will be at a safer airspeed and there will be less drag for the motor to overcome. Aborting a takeoff is an important procedure and experienced mountain glider pilots must note that this is an option for every powered takeoff. Unlike a mountain launch, where your best bet is usually to continue once begun, significant sorrow and money can be saved by aborting a powered harness takeoff if things are not going exactly right. To abort a takeoff do not just stop running; between yourself, the glider and the harness you will have a lot of momentum. First release the throttle while you continue running, then the drag of the harness' skids will help you to bleed off the momentum that both you and the glider have achieved, sense the speed and flare to a stop. If that fails, settle the glider on its safety wheels while pushing out the control bar and roll to a stop, then hit the kill switch. Learning to let go of the mouth-throttle is critical. When things start to go wrong, the general tendency is to clench up our jaws, which compounds the problem with unwanted thrust; letting go of the mouth-throttle is the equivalent of tow line release and must be done without hesitation when needed. It is very useful to practice releasing the mouth-throttle while under stress by using dynamic mental image. Powered harness on climb at full power. Salinas, Baja California, Mexico. In general, the pilot must use best glide speed for takeoff and climb. The pilot must not push out on takeoff or climb. Note that the glider will climb on increased speed. Using full VG from a safe height is beneficial to climb rate. Many pilots new to powered flying make this common error, they are tempted to 'push-out' on climb but that causes to fly too slowly. To an observer on the ground they appear to wobble around and lose directional control; to the pilot there is a feeling that the glider wants to wind into turns and the wing feels unstable. The cause is a lack of airspeed. 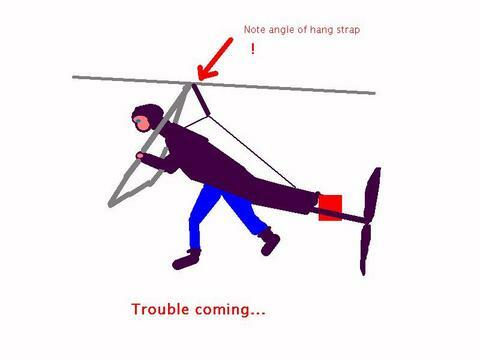 Pushing out will decrease airspeed -just as when free hang gliding- and the wing may stall. Even if it doesn't, it will certainly exhibit those nasty characteristics of slow speed flight - dropping a wing into turns and feeling unstable in roll, in short, the pilot will be in “mush mode” with very poor control authority. As soon as it is safe, the pilot gets the feet into the harness for stability (or supine position if flying the DoodleBug). One must keep the wings level at all times, keep the control bar pulled in and be ready to correct any roll early on. Again, note that the best rate of climb occurs at higher airspeed and that most flexible wings climb well at 10 miles (16 km)/h above their stall speed. Today's powered harnesses develop a maximum of 45 kg (100 lb) of static thrust, but the rate of climb also depends on weather conditions such as field altitude, air temperature, humidity, etc., and on glider size and wing loading. The harness' thrust is adequate for a sustained 200 - 300 ft/min (1.0 - 1.5 m/s) rate of climb at full power even when flying at airspeeds well above minimum sink. If a powered harness experience an engine failure when climbing steeply, the aircraft will lose a lot of height before recovering; climbing at a flatter angle and at a faster airspeed makes recovery easier and safer. Cruise speed varies between hang glider brand, model, size and wing loading. To cruise fast and level while under power, pilots apply about 75% throttle (~ 6600 rpm for the Raket 120) and increasingly pull in while glancing at the variometer until top speed is achieved without descending. Flight autonomy with 4 liters (approx. 1 Gallon) of fuel depends on throttle settings, but it ranges between 60 and 90 minutes of continuous engine use. Adding the motor weight behind one's feet in a prone configuration unit, moves the combined center of gravity lower on the pilot's body. Because the pilot is now located farther forward in relation to the hang point, the control bar will appear to be further back by about 25 centimetres (9.8 in). This apparent bar trim position change occurs without the addition of power. Note that the actual trim characteristics of the glider have not changed, only the pilot's position with respect to the control bar. Though this new bar position may be disconcerting to experienced hang glider pilots, it should be clear that the pilot must rely instead on feeling the bar pressure and remain aware of airspeed at all times. With more experience, the new powered pilot will learn the new bar positions and use them automatically when flying the powered harness. Replacing the base tube for a 'speed bar' is quite recommended. Even very experienced hang glider pilots will need to learn some new tricks when it comes to turning under power. Most hang glider pilots were taught to 'lead with your feet' in making turns. This is effective for un-powered flight, but adding weight and thrust to our feet changes things. Note that full power turns will become increasingly unstable with increasing roll angle so once the glider gains enough altitude, most pilots reduce the throttle for easier control during turns, especially on the early training stage. Power on - Ideally, keep the harness (and thrust line) parallel with the keel of the wing so that the thrust pushes forwards and not sideways; some pilots simply yaw their body momentarily as that changes the thrust line and helps engage a turn. Most pilots use a combination of both weight-shift and thrust line to turn under power. Novice FLPHG pilots must not attempt powered turns at low altitude. Medium power and shallow bank turns at a safe height are recommended for the first few flights so that the new FLPHG pilot can get a feel for the effects of thrust on glider behavior. If the glider enters a powered 'lockout' simply reduce the power and stabilize the wing as usual. Shallow and medium bank turns must be well coordinated to prevent the engine from 'falling' toward the lower side and engaging the glider on a diving turn. Power off - Turns in a prone unit hooked to a flex wing, require of a somewhat additional effort to weight-shift the center of gravity; because of the engine mass, some experienced pilots new to powered harnesses find that only the front half of their body moves, that is: they cross-control without an effective shift of their center of gravity. Keeping the body parallel to the keel for turns or corrections is easier than weight-shifting one's feet. Shallow and medium bank turns must be well coordinated to prevent the engine from 'falling' toward the lower side and engaging the glider on a diving turn. Limit Lines - The DoodleBug is a supine unit that uses limit lines at the rear to keep the engine & propeller relatively stationary; the port line is approx. 1 inch shorter than the starboard line, and are secured to the lower wing wire tangs so that sideways movement of the harness is restricted to 10.1 centimetres (4.0 in) approximately on each side of dead centre. As the pilot moves to one side, this arrangement moves the thrust line so that it actually pushes in the turn direction. It is evident that this setup is beneficial in helping to create a more coordinated turn and also in stability while flying through turbulence. Some pilots flying prone configuration units like the freedom of being able to control the direction of thrust as it gives them another way to fine tune a turn. Prone configuration units do not require of limit lines but they are recommended during the early training stages. Limit lines may also offer help when moderate thermal turbulence is expected as they help prevent the engine from 'falling' toward the lower side of the turn or provoke oscillations. On the ground, the limit lines might also prevent propeller strikes to the trailing edge of the wing. Pilot semi-upright with one leg in the harness' boot for stability during final approach. As usual, the pilot must plan the landing approach and execute it as planned in order to avoid sharp turns or sudden changes in aircraft attitudes. The FLPHG pilot must get ready at higher altitude than usual in order to set a landing configuration: turn off the engine (optional), lock the propeller, the harness' legs have to be un-clipped and the harness unzipped, and it is a little more work than a normal pod harness, definitely not something to be trying to do on final. The engine may be left on idle (if equipped with a centrifugal clutch) during final glide and if the pilot decides to abort the landing, then the propeller brake is released and the mouth throttle activated. But the landings are surprisingly easy: keep the speed up as usual and keep one leg straight and snug in the harness' boot for as long as possible to prevent the motor from swinging sideways. Bleed off speed on ground effect and when you feel the harness' legs dragging, wait for the flare window appropriate for the glider and flare mildly. Your forward position and extra mass give you more flare authority than you are used to. The mass of the motor still wants to continue forward, so expect a feeling like a nudge from behind after you have landed, and be prepared to take a step or two. Alternatively, running out the landing is possible as the rear skids generate enough drag against the ground to slow down the aircraft. Although it started out as simply gliding down small hills on low performance wings, hang gliding over the last 120 years has evolved to the ability to soar for hours with hawks and eagles, gain thousands of feet of altitude in thermal updrafts, and fly cross country over distances of hundreds of miles. If the pilot finds lift, he/she may wish to shut off the engine and soar. While soaring, the propeller is locked or folded to reduce drag. 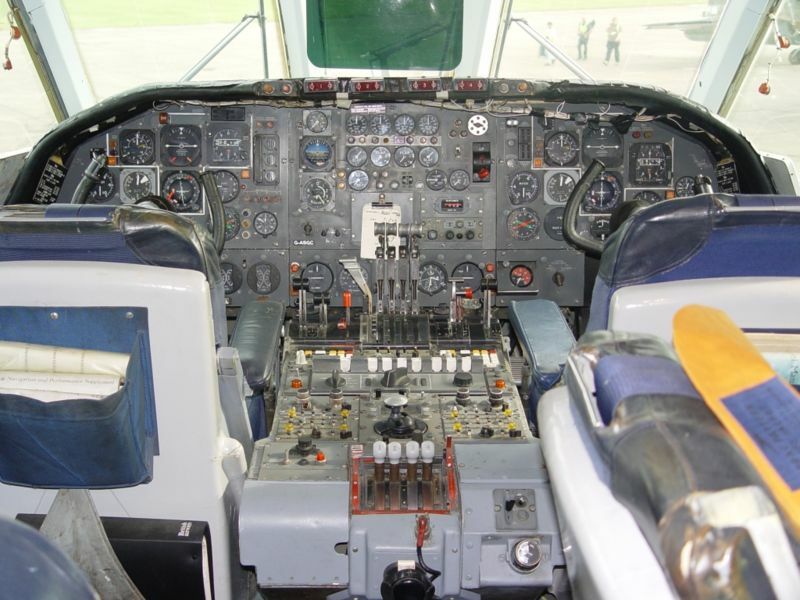 In-flight engine restarts can be a powerful didactic tool for learning or improving thermalling skills, as the pilot does not have to land every time he does an incorrect decision and loses the lift. This brings about significant increase in soaring airtime and opportunities needed to better understand lift, usable cloud life, sink, drift, ridge lift, timing transition glides, etc. The most commonly used source of lift is created by the sun's energy heating the ground which in turn heats the air above it. This warm air rises in columns known as thermals. Soaring pilots quickly become aware of visual indications of thermals such as: cumulus clouds, cloud streets, dust devils, soaring birds and haze domes. Having located a thermal, a glider pilot will circle within the area of rising air to gain height. 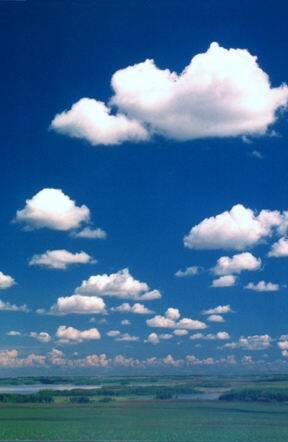 In the case of a cloud street, thermals can line up with the wind creating rows of thermals and sinking air. A pilot can use a cloud street to fly long straightline distances by remaining in the row of rising air. Another form of lift occurs when the wind meets a mountain, cliff or hill. The air is deflected up the windward face of the mountain forming lift. Gliders can "surf" and climb in this rising air by flying along the feature. Another name for flying with ridge lift is slope soaring. The third main type of lift used by glider pilots are the lee waves that occur near mountains. The obstruction to the airflow can generate standing waves with alternating areas of lift and sink. The top of each wave peak is often marked by lenticular cloud formations. Another form of lift results from the convergence of air masses, as with a sea-breeze front. More exotic forms of lift are the polar vortexes which the Perlan Project hopes to use to soar to great altitudes.A rare phenomenon known as Morning Glory has also been used by glider pilots in Australia. An ideal glider would be an intermediate model that has a low stall speed, easy handling, good penetration and of the correct size. Consider that by adding about 40 lb to the hook-in weight, the free flying stall speed is increased by about 7% or 8% so a glider of appropriate size (hook in weight range) should be used. For first glider, the best choices are flexible gliders with single surface (novice) because of their low stall speed, ease of landing and gentle handling characteristics. Examples: Falcon II, Mark IV, Pulse, Eagle and Target, to name a few (2006). Low stall speed - very important, especially for a beginner to FLPHG. Lower takeoff speeds are safer and less intimidating. Also good for higher altitudes. Easy Handling/Roll Stable - roll stability is important, especially for a beginner. A spirally unstable glider (some high performance gliders have been tuned that way to help initiate turns into thermals) will be more of a challenge while climbing under power. Good L/D (Lift/Drag ratio) - for maximum climb rate and best glide ratio. A fast rigid wing will climb better than a floater. Good L/D is useful to pilots who enjoy soaring cross-country power off. Short to moderate root chord - for propeller clearance. All powered harnesses require the glider keel to be cut be cut off no further than 119 centimetres (47 in) behind the hang point; the cut off section can be sleeved and refitted to help rig the wing. Medium and high performance flexible hang gliders may also be used but only by well experienced pilots. 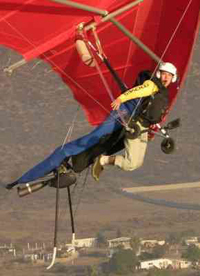 Most "rigid wing" hang gliders such as the Exxtacy, Axxess and ATOS accept the powered harness readily. Some pilots believe the Exxtacy to be the ultimate hang glider for flying with a powered harness because of its docility, high wing loading, penetration, ease of control with minimum weight-shift and the advantage of flaps, making the landings much easier. In order to maximize a pilot's understanding of how the hang glider is flying, most pilots carry a series of small instruments, often interconnected. The most basic being an airspeed indicator, a variometer and altimeter. Many pilots also use two-way communication radios and some also carry a map and/or GPS unit. Some pilots also make use of a small tachometer to ensure the engine is developing full power prior to takeoff. 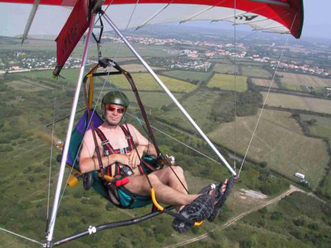 Hang gliders do not have instrument panels as such, so all the instruments are mounted on the control frame of the glider, except for the radio and tachometer which are mounted on the harness. People can sense the acceleration when they first enter a rising thermal, but they cannot detect the difference between constant rising air and constant sinking air, so they turn to technology for help. A variometer is a very sensitive vertical speed indicator; in other words, indicates climb or sink rate with audio signals (beeps) and/or a visual display. 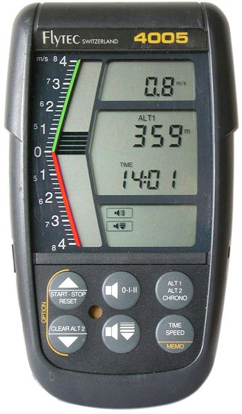 These units are generally electronic, vary in sophistication and often include, an altimeter and airspeed indicator. More advanced units often incorporate a barograph for recording flight data and/or a built in GPS. The main purpose of a variometer is in helping a pilot find and stay in the ‘core’ of a thermal to maximise height gain, and conversely indicating when he or she is in sinking air, and needs to find rising air. Variometers are sometimes capable of electronic calculations based on the 'MacCready Ring' to indicate the optimal speed to fly for given conditions. 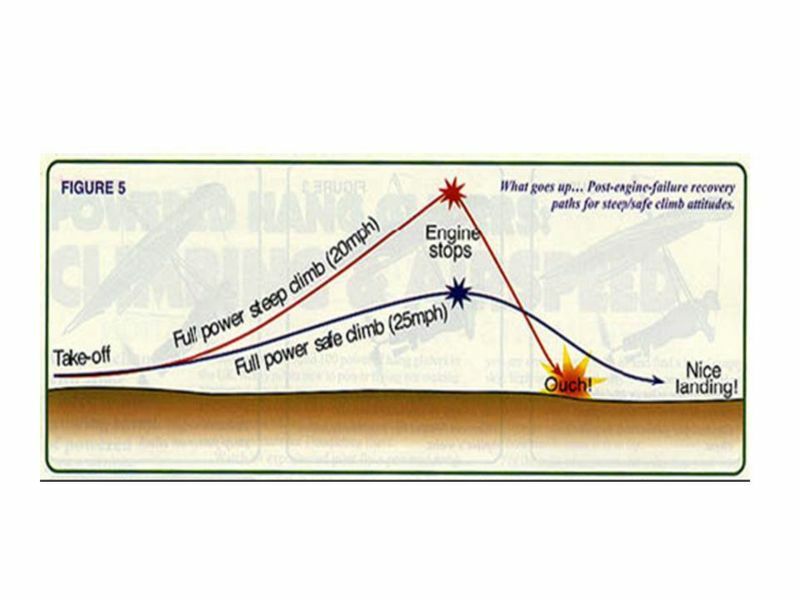 The MacCready theory solves the problem of how fast a pilot should cruise between thermals, given both the average lift the pilot expects in the next thermal climb, as well as the amount of lift or sink he encounters in cruise mode. Some electronic variometers make the calculations automatically, after allowing for factors such as the glider's theoretical performance (glide ratio), altitude, hook in weight and wind direction. Pilots use radio for training purposes and when traveling on cross-country flights. Radios used are PTT (push-to-talk) transceivers. Best range is achieved with FM VHF 2-meter band (144–148 MHz) radios. Usually a microphone and earphones are incorporated in the helmet and the PTT switch is strapped to a finger. GPS (global positioning system) is a necessary navigation accessory when flying competitions, where it has to be demonstrated that way-points have been correctly passed. More common uses include being able to determine drift due to the prevailing wind, providing position information to allow restricted airspace to be avoided, and identifying one’s location for retrieval teams after landing-out in unfamiliar territory. It can also be interesting to view a GPS track of a flight when back on the ground, to analyze flying technique. Computer software is available which allows various different analyses of GPS tracks. More recently, the use of GPS data, linked to a computer, has enabled pilots to share 3D tracks of their flights on Google Earth. This fascinating insight allows comparisons between competing pilots to be made in a detailed 'post-flight' analysis. Glider launch autonomy. No crew required. Multiple takeoff areas available. No long drives. No need to invest a whole day in order to fly. Easy to face the wind for takeoff, regardless of wind direction. Ridge soaring new places without land access to the top. In-flight restarts allow the pilot to soar cross-country downwind and then fly under power back to his departure point. Restarts can also be a powerful didactic tool for learning or improving thermalling skills. Significant increase in soaring airtime and opportunities needed to better understand thermals, usable cloud life, sink, drift, transition glides, ridge lift, landing approach, etc. Ability to fly in non-thermal days. By far, the largest disadvantage is the engine and propeller noise: about 90 dB at 1 m (3 ft) and about 58 dB at 760 metres (2,500 ft) AGL. The added harness weight can increase injury in case of a severe nose in. There is a slightly longer set-up time with a more complex preflight. Requires some basic knowledge of two-stroke engine maintenance and repair. Slight drag increase when on glide. Increased effort required to weight-shift a flexible wing. Prone configuration units are more difficult to coordinate a sustained high bank turn. 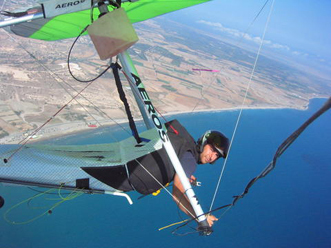 Powered hang gliders' technology is quite young and continuously evolving and improving. A ducted fan offers greater propulsive efficiency and a smaller frontal area. By reducing propeller blade tip losses and directing its thrust towards the back only, the ducted fan is more efficient in producing thrust than a conventional propeller advancing at low speed (80 knots). Ducted fans are quieter than propellers: they shield the blade noise, and reduce the tip speed and intensity of the tip vortices both of which contribute to noise production. Requires of high RPM and minimal vibration - Electric or Wankel engine needed. A significant weight increase even if constructed from advanced composites. Tradeoff between additional power and drag increase during glide (power off) and also, at an angle of incidence of 32, parts of the duct would be stalled and producing drag. On 1979, Larry Mauro added a landing gear to an electric Solar Riser hang glider; although it was the first solar airplane, it may not be universally held as the first foot-launched electric powered hang glider. Advances in batteries, solar cells, and ultracapacitors are being considered for bringing electric powered paragliders and hang gliders to practical and affordable use. Designers Csaba Lemak and Patrick MacKenzie constructed a powered paraglider powered by 112 Lithium Polymer (LiPo) batteries and a 17 hp (13 kW) custom wound three phase motor weighing 1.5 kg coupled to a 3.6 to 1 reduction drive. Their electric powered paraglider flew for the first time on June 6, 2006 in Ontario, Canada. With flight autonomy of only 35 minutes, it has many advantages, such as ease of operation, minimum maintenance and power output is not altitude dependent. ElectroPropulsion Ltd. and Electric Flight Systems Ltd. have teamed up with the British Defence Academy scientists to assist in research and development of electric powered flight optimised for the leisure aviation market. No flammable fuel or oil required. Minimal cooling required, allowing for better aerodynamic profile. Noise produced only by the propeller. Battery weight, cost, and recharge method. 1979 April 29: at Flabob Airport, California, Larry Mauro flew the Solar Riser with an electric motor powered by storage batteries charged from the sun. 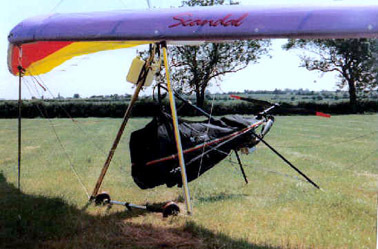 The Solar Riser was a modified Easy Riser hang glider. 2005 June: Werner Eck began work on his electric drive for limp unstiffened hang gliders. 2006, June 6: in Canada, Casaba LemakLimp-wing hang glider(unstiffened governable gliding wing which is currently called "paraglider") takes off flatland using electric motor. 2006, December 19: Prototype Electric-Paramotor from Helix-Carbon GmbH shows electric motor in the Coupe Icare in Saint Hilaire. 2007 at the German Free Flight Trade Fair in Garmisch-Partenkirchen, Dr. Ing. Werner Eck and his partner Jochen Geiger showed electric drives for hang gliders (for limp paraglider types and stiffened wing types).